Down & Dirty: Don't rub it in. Two of my favorite garden bloggers Scott Calhoun and Gardener of La Mancha have recently posted images of their floriferous surroundings: huge masses of annual poppies in AZ and lovely woodland natives in northern CA. I thought it only fair to post a photo I took this afternoon in my Pennsylvania back garden. While Scott & G of La M take brisk hikes (or leisurely walks) over green mountains and through forests brimming with spring flowers, I huddle by the wood stove. It's 9 degrees (F) and the driveway is so slippery that I risked life and lens just to snap this photo. It will be at least another month before the Galanthus nivalis (snow drops) even begin to poke their little green heads up. Baby, it's cold outside. So please don't rub it in. P.S. Here's an unsolicited comment from Kelly Richardson, who attended my second lecture in Seattle; it was posted on the show blog and made me feel much better after the Sally Field debacle. I attended a seminar called “No Space? 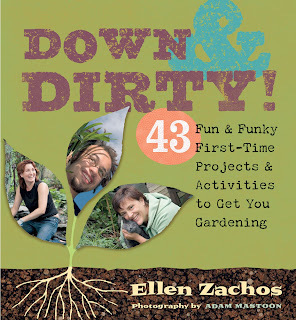 No Problem!” This was a step-by-step container gardening guide by Ellen Zachos, who is the author of Down and Dirty: 43 Fun and Funky Garden Projects. Her vibrant personality and interesting ideas made the time fly by with me wanting more. I have been inspired to try my hand at an herb container garden by my kitchen window. I really enjoyed Down and Dirty and I'm really excited to see that you have a blog. You'll being hearing more from me!! Hello Wicked Gardener, what a great name! I envy you your mild climate, especially on a day like today. Besides, weren't you in Mexico just the other day? Oh yeah, right, Mexico. How quickly I forget! And I'll be speaking at Epcot at the end of March, so that's a little more sunshine to look forward to. 9 degrees - brrr indeed! I am desisting all complaints forthwith. And congratulations on the great feedback from your container lecture. I'll be recommending D&D in my handouts for mu classes tomorrow. I saw some bulb foliage poking up four inches tall or so in Brooklyn front yards today, a welcome sign of spring given the chill. Nice feedback on your second presentation--glad it made up for being scheduled opposite S.F. Ohh! I'm getting a trip to Epcot's Flower and Garden Fest for my birthday! When are you speaking? I'll be at the Epcot Flower and Garden Festival on 3/28, 29, & 30. I'm speaking/doing a demo twice a day, each day, once in the morning and once in the afternoon. I don't know the exact time or place yet. If you come by, please say hello!